Next milk paint advanced techniques. Again…..more AWESOME tips!!! Thanks a lot!! Well yeah, I made one green chalkboard with a huge old frame which I really like and then a smaller black one with a left over old lentil on top and and a beautiful old scrap for the bottom,no sides. I like that one, too. And,I actually FINALLY have the frame of a dresser mirror to convert!…….left over from a beautiful old dresser I refinished for my son. Soooooo, I’d love to win this prize! I’d be using it for sure! 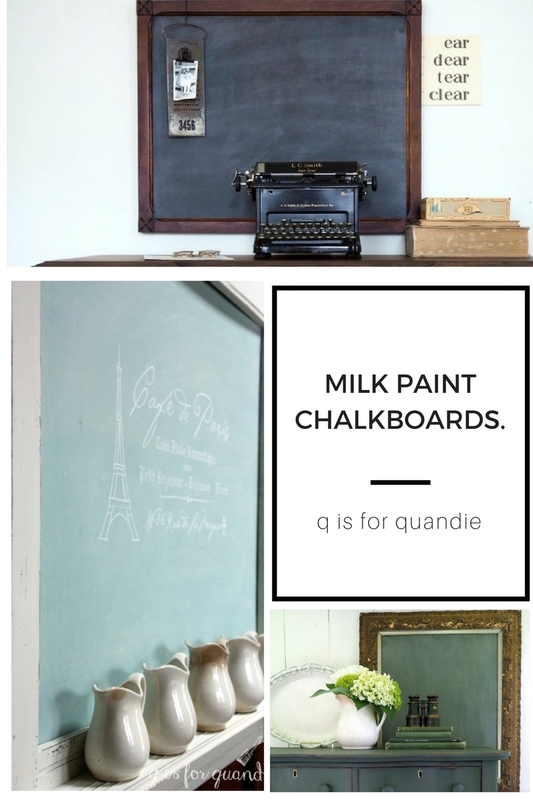 I have a large chalkboard and would love to jazz it up a bit with milkpaint. I’ve never tried milkpaint, so I would be excited to be a winner of some! Thanks for your many helpful hints!! And I always thought I had to have chalkboard paint!! 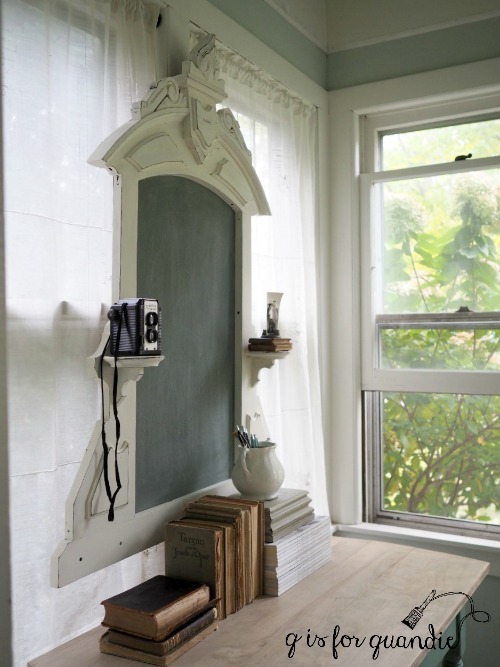 I have no chalk boards… but I have an antique mirror that could become one! I have the solid end panels of a vintage crib that would make awesome chalk boards!. 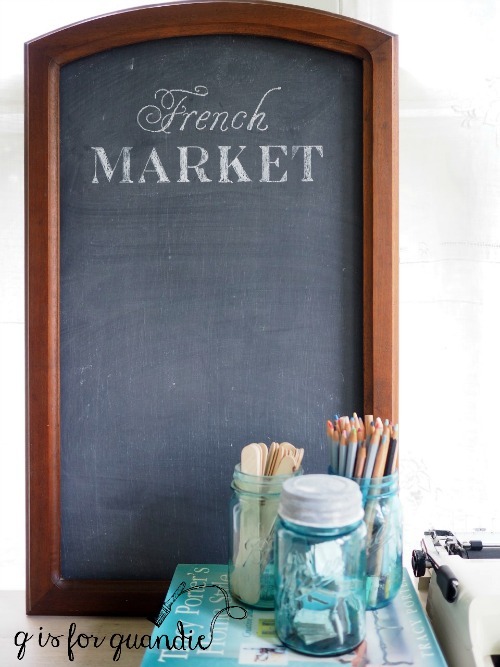 I’ve never used milk paint as chalk board paint but I’d love to give it a try! I currently have 2 chalk boards but would like a hundred more!!! I do weddings so I have several vintage framed chalks boards. In my work room I actually have clipboards that I’ve made into chalk clip boards. They are fun to change out sayings or just hang inspirational pictures for projects to do. I even went so far as to make the shiny clips rusty and crusty. That sounds like a fun project! I’ve got a stash of old clipboards that I’ve picked up at garage sales and one of these days I want to paint them up. I have one authentic classroom style chalkboard in my studio and one I made with chalkboard paint and a frame I picked up at Goodwill. I like how the chalkboard I made turned out but chalkboard paint is pretty much only good for chalkboards! 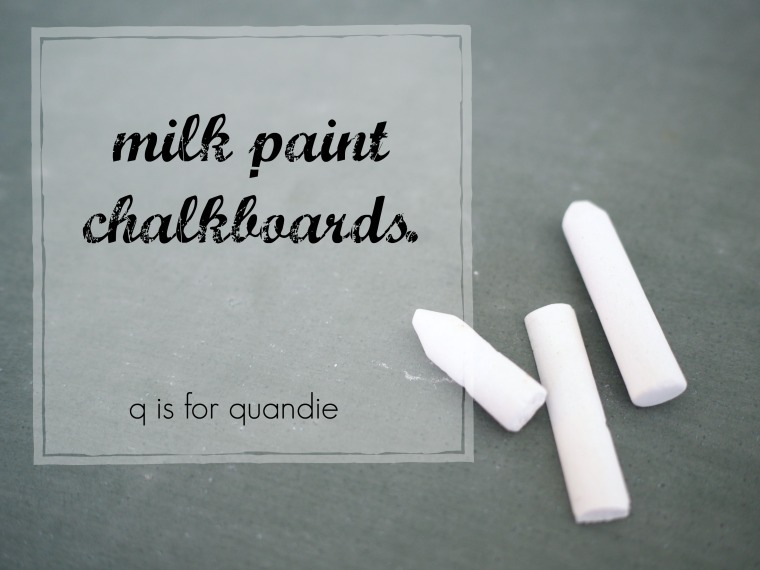 Having some paint that is multi-purpose like the milk paint appears to be would be handy! I have 2 chalkboards! I love to write things on them. No chalk boards yet but have some old mirror frames that would work great. 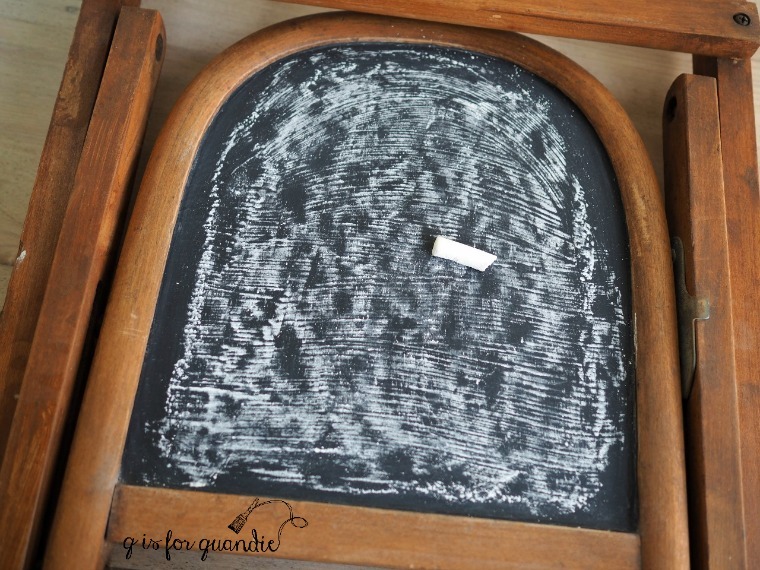 I do not have a chalk board in my home and I need to change that! Thanks! I have made a chalkboard from what we think was my great grandmothers old mirror frame! Some day I hope to post a lot of the pics that I have saved of my husbands hand crafted wooden creations and my finishings over the years! Love to see your pics and tips!! Keep them coming! I have 4 chalkboards all made with chalk paint. I like black ones. There’s something about black and white drama that appeals to me. 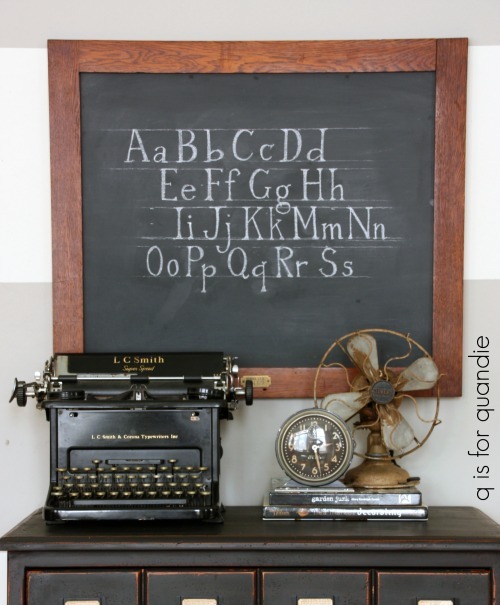 I don’t have any chalkboards in my house, but my sister and I had one in our room when we were young which we used daily. That was back in the 50s and 60s. My kids had portable chalkboards with compartments underneath to hold supplies. They enjoyed those. Love your chalkboards! I have a frame that will make a nice chalkboard. I have two chalkboards but they are nothing compared to yours. Great tips and inspiration today!! Thank you! I have no chalkboards either. Pathetic I know. I would love one in my kitchen but I have an open floorplan so wallspace is allocated to cabinets and appliances. I do adore the masterpieces you churn out. 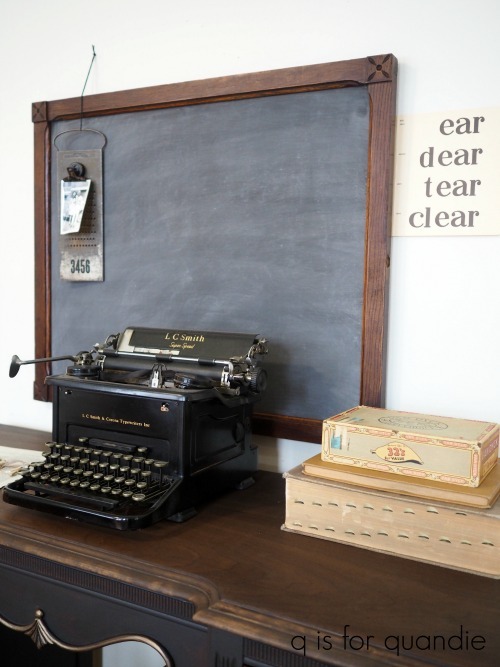 I have a huge 3′ x 6′ vintage chalkboard from a old school I would love to redo with milk paint. Would love to win milk paint!! Ideas galore of projects i’d Love to try!! I would love to win this day’s prize and try making a chalkboard. I think green would be awesome. Thanks so much. I have two chalkboards, I’ve never thought of decorating them my self! Duh! The lettering book- who knew such things existed!?! Thank you for sharing another detailed informative creative article. 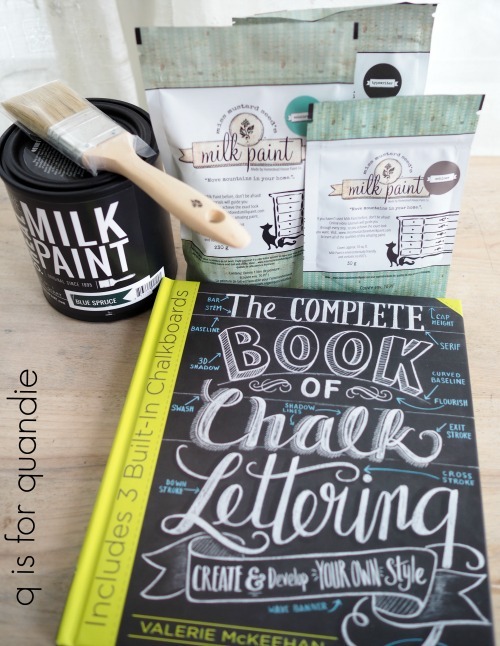 The book is really helpful if you want to work on improving your chalkboard art skills! I have the perfect frame/mirror to use the chalkboard application on!! No chalkboards yet, but planning some! 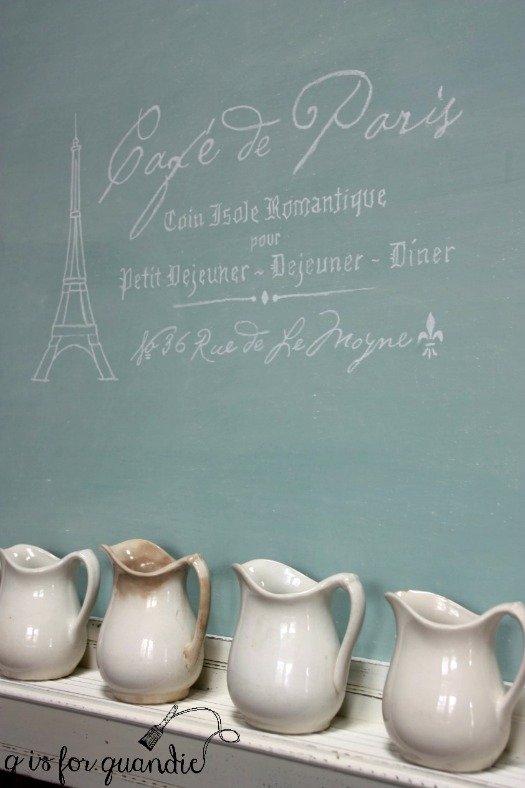 I love all of the chalk boards, but the aqua one is swoony. Your lettering is beautiful, I think I would need a lot of practice to come close. If you’re looking at the lettering on the aqua chalkboard, I cheated on that one and used a stencil to get the basic lines in place then went back and darkened it up by hand. Great post! I have bulletin boards in my home but now I may have to rethink them. Thank you again for your informative blog. I love that book. I got it for Christmas a couple years ago after you recommended it. I wish I could add my picture of some of the lettering I did. I love, love, love it. I have a black board stand near my door that I used for seasonal decorations along with the lettering–skates, ball and bat, flags for the 4th, antlers/leaves/feathers for fall. I also found the old childhood desk that we had and took the top half part that opens and had a chalkboard on the front, repainted it and added foam core and pins inside for earrings/necklaces. I do not have any chalkboards in my house, but I have several old frames I want to make into chalkboards!! Although I have made chalkboards before as I walked around I was surprised to learn my house is chalkboard free. Sounds like it’s time to make one for yourself! I will never tire of chalkboards! Yours are amazingly clever! Wow! These prizes just keep getting better every day! 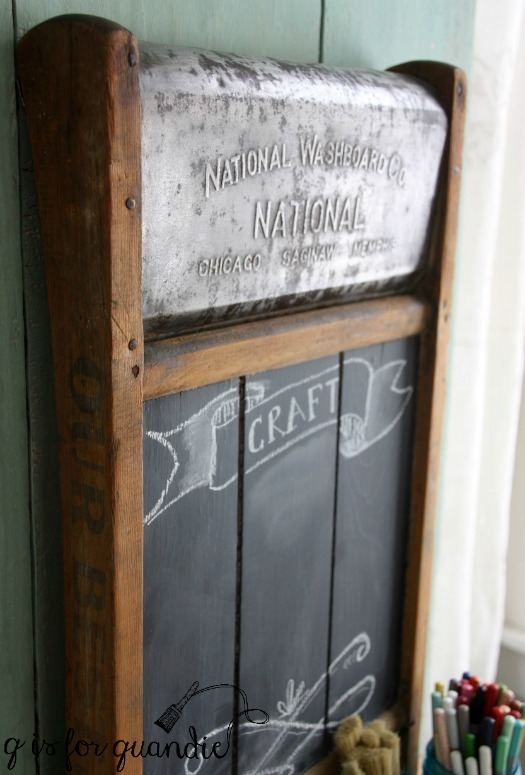 I currently have just two chalkboards in my home…big ones made from vintage frames painted white. I’ve also made lots of little ones to sell, using Rustoleum chalkboard paint. Had no clue I could use milk paint instead. This opens so many possibilities! Thanks again for your fun and informative post, and the opportunity to experiment with the goodies in this prize package! It was an eye opener for me too. Especially since I always seem to have lots of partially used bags of milk paint on hand. 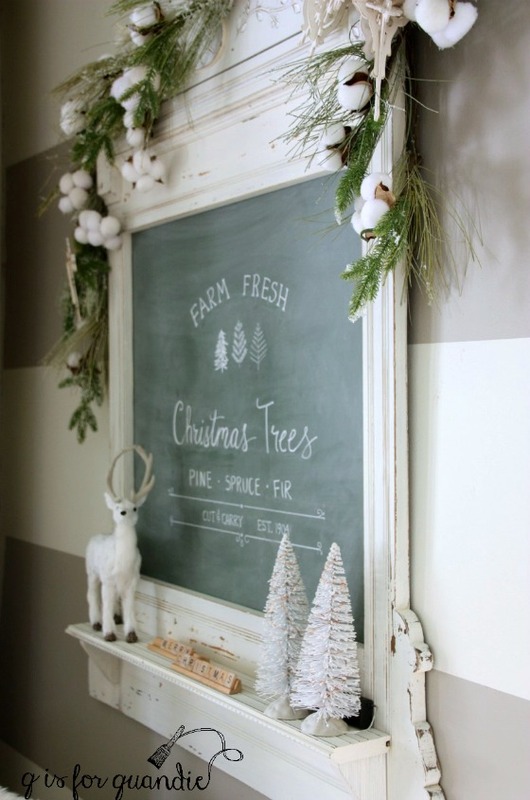 No need to also have chalkboard paint! Love these!!! I have so many things out in the junk shop that I could turn into one! You’ve really got my creative wheels turning with this post! I have one small one in our house, but out in the shop I have two very large ones that came out of a Sunday school classroom. But my goodness they are soooo heavy that I just have them leaned against the wall until I sell them. One of those giant schoolhouse chalkboards would be perfect for my dining room. Is your shop anywhere near me? 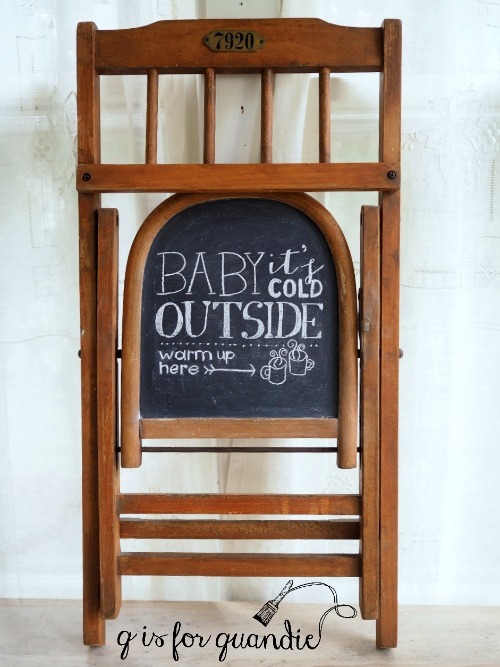 Welllllll….I currently have four chalkboards and one chalkboard bunting. But, with your amazing tips there will be soooo many more now! Thanks! You inspire me to keep starting projects! Gotta focus and finish some now! Thanks! Yes I have two antique slate chalkboards in my home. I don’t have a single chalkboard in my house but I have 2 outside..lol…I turned a stainless steel table into a chalkboard for my kids…first time making my own chalk paint. They love it. Then I did an old piece wood that was on its way to the trahbin. Painted it and hung it up on the garden wall..Kids would do their lessons on it too! I have made one chalkboards using chalk paint in black color. But never thought about trying different colors like teal – how cool. Love all yourchalkboards & I am excited to try making my own if I win! My favorite is you white with the green! I absolutely love the chalkboard in that beat up ornate gold frame…I think I need to go thrifting again! I do have a few chalkboards in my house and I have sold some in the past. I’ve never made one with Milk Paint. I’ve only used chalkboard paint but I’m definitely going to try this! 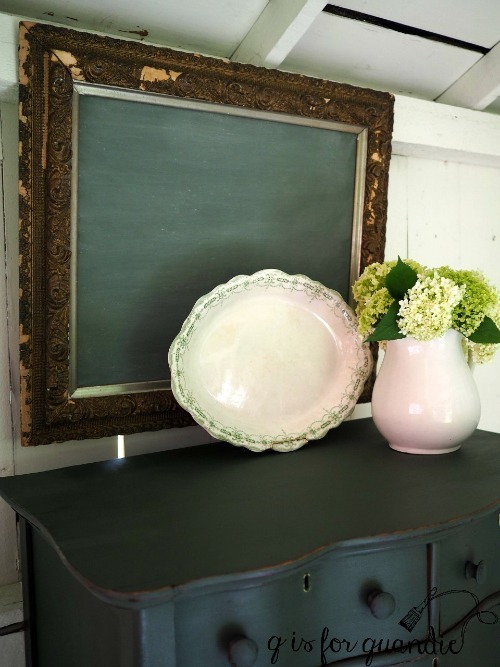 I had no idea you could use milk paint for a chalkboard! Now I will be looking for things to make a cool, colorful chalkboard with an inspiring message of the day! Thanks! 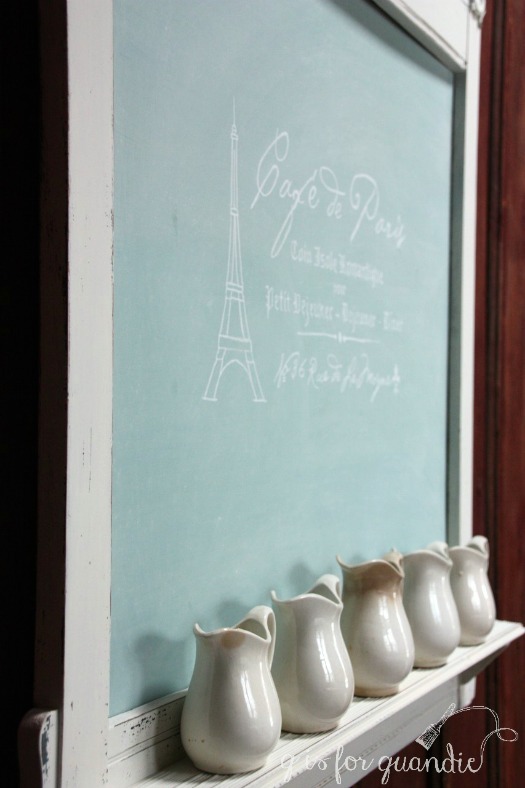 I have yet to try a milk paint chalkboard, sounds fun and simple!